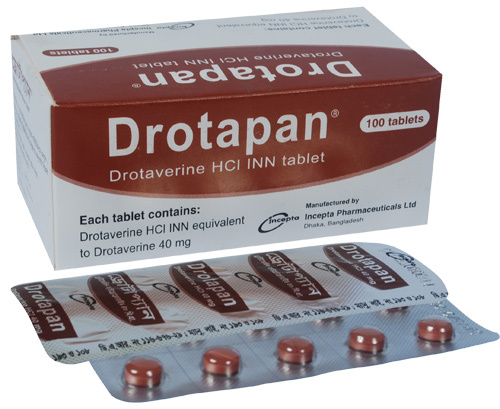 Drotapan tablet: Each tablet contains Drotaverine HCl INN equivalent to Drotaverine 40 mg.
Drotaverine is a spasmolytic agent which acts directly on smooth muscle cells by adsorption on the cell surface. Drotaverine inhibits the phosphodiesterase enzyme which leads to an increase of the cAMP level producing smooth muscle cell relaxation. It is thought that Drotaverine also inhibits the initial calcium uptake of the cell. Drotaverine is characterized by a rapid onset of action which is very advantageous in cases of acute painful spastic conditions. Because of its direct action on smooth muscle, Drotaverine does not affect the autonomic nervous system. Therefore Drotaverine is free of the side effects associated with anticholinergic antispasmodics and can be used in glaucoma and prostatic hypertrophy. In addition to its spasmolytic and vasodilatory actions, Drotaverine elicits a selective blockade of cardiac beta receptors. Spastic conditions of the gastrointestinal tract, irritable bowel syndrome. Biliary colics and spastic conditions of the biliary tract: Cholecystolithiasis, cholecystitis, cholangitis. Renal colics and spastic conditions of the urogenital tract: Nephrolithiasis, ureterolithiasis, pyelitis, cystitis. Spastic conditions of the uterus: Dysmenorrhea, imminent abortion, uterine tetanus. Adults: 1 to 2 tablets, 3 times daily. Children (over 6 years): 1/2 to 1 tablet, 1-2 times daily. Children (1-6 years): 1/4 to 1/2 tablet, 1-2 times daily. In rare cases nausea and vomiting may occur. Caution should be taken for patients suffering from liver and kidney disease. There is no known case of teratogenecity in animal studies. However, the use of drotaverine should be avoided during pregnancy and lactation.